Do you need a tough, reliable PA Amplifier that you can take anywhere even outside and still have high volume & crystal clear sound? Punchy and powerful, portable and practical, this rugged Dance Combo portable amplifier is perfect for filling a studio or hall with sound that will get your heart going. 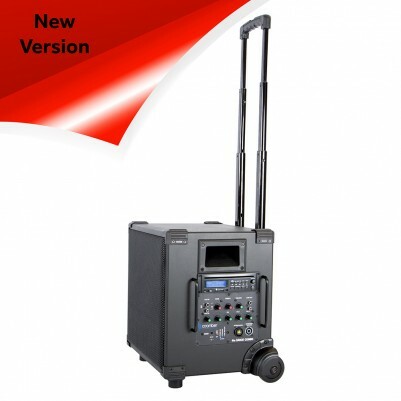 This is the most portable unit in our range of PA's. With both internal rechargeable batteries and integral trolley, you can take it with you outside or from location to location with no effort. The Portable Public Address Amplifier comes with a free iPod lead, battery charger/power supply. For medium halls use the unit with the 430 speakers. Play and amplify tracks on CDs, USBs, SD cards, smartphones, tablets, laptops. Have many hours use from its internal battery power. Take it around and use on a 35mm tripod stand so that it can be used in any location. Connect to an optional additional speaker or two which will double the output of power for even more clarity. Slow down or speed up the audio on CD/USB/SD card. Set up and be playing in seconds in the gym, aerobics classes, dance classes, schools and other events even on the sports field. This compact truly portable rugged Portable Public Address Amplifier is so versatile and perfect for every application. It is easy to use and will give you impressive results. It will fill most studios or halls with sound on its own, but it can also be connected to one or two of our 430 speakers to double the power and distribute the sound. The clarity of the voice and bass response has impressed many critics of audio equipment. It does enhance the performance and the users' credibility by using a professional quality British made audio equipment.